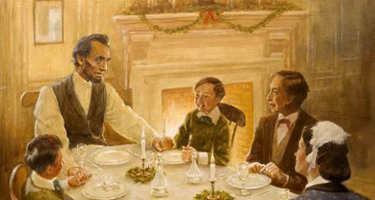 An artist’s conception of the Lincoln family having Christmas dinner in the White House. Christmas 1864, Washington D.C. If things were looking gloomy for Varina Howell and her “Jeffie” in Richmond, across the Potomac in Washington it was quite the opposite that December. 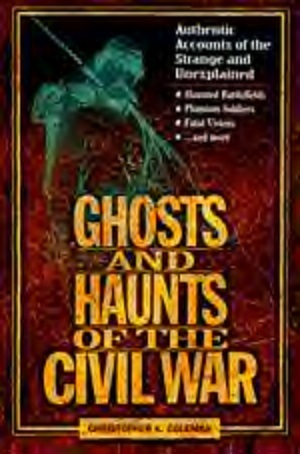 That Fall, General Sherman had begun his famous (or infamous) march through Georgia, but for weeks Lincoln had had no word from Sherman or his army of 62,000. 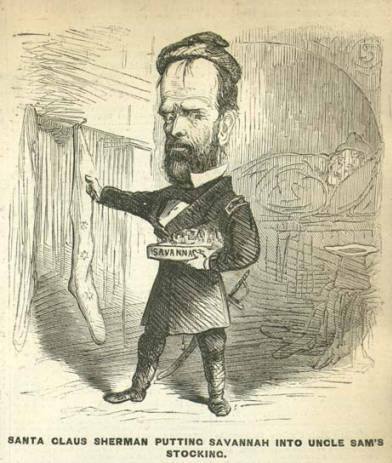 In contrast to his scorched earth campaign through rural Georgia, Sherman and his men were magnanimous towards the citizens of Savannah and “Uncle Billie” provided food and merriment for Christmas to the conquered city. 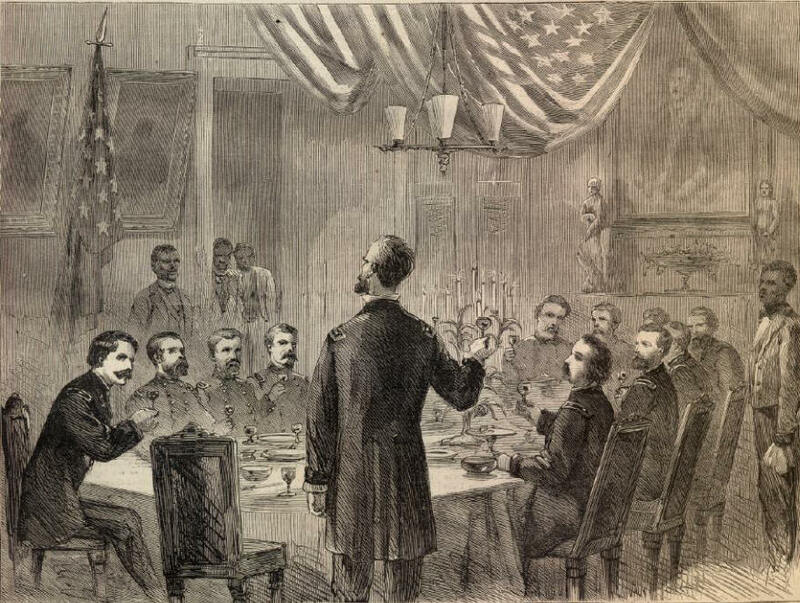 Sherman hosts a victory dinner on Christmas day for his officers. Sherman meanwhile held a celebratory supper for his officers. He also provided for the citizens of Savannah–with victuals stolen from the farms and plantations of Georgia. 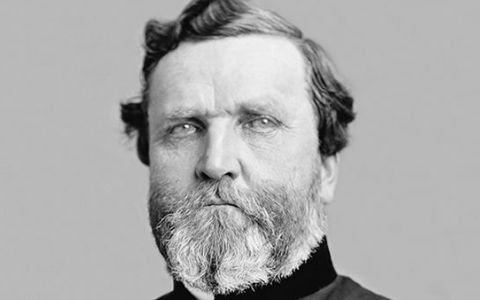 In Tennessee, less theatrically, but far more importantly, General Thomas had performed a great service to the Union cause, decimating the Army of Tennessee at the Battle of Nashville. The Battle of Nashville in mid December 1864 sealed the Confederacy’s fate. 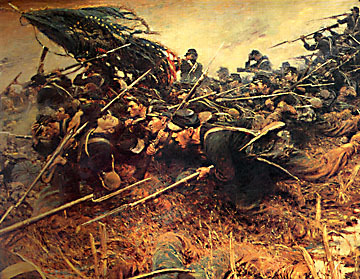 (Attack on Shy’s Hill by Howard Pyle). It was the last effective field army the Confederates had outside of Virginia. To all intents and purposes, Lee’s Army of Northern Virginia was isolated, and Richmond, the Confederate capitol, was doomed. 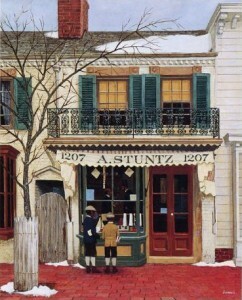 Lincoln and his son Tad often visited Stuntz’s Toy Shop in Washington, DC. While the Lincolns are not thought to have had a Christmas tree in the White House, it is known that the President would take Tad to the city’s best toy shop, Stuntz’s Toy Store, to buy him presents. Unlike many parents of their day who believed in “spare the rod, spoil the child,” both Abraham and Mary Lincoln were indulgent parents, who generally spoiled their boys silly. Likely, Lincoln and Tad would have been in Stuntz’s that Christmas. The situation in Washington and much of the North in 1864 was summed up neatly by Thomas Nast in a famous propaganda poster for Harper’s during Christmas Week of 1864, called The Union Christmas. It depicts President Lincoln standing at a door, with him offering the cold and frostbitten Southern soldiers an invitation to rejoin the Union and enjoy the feast. 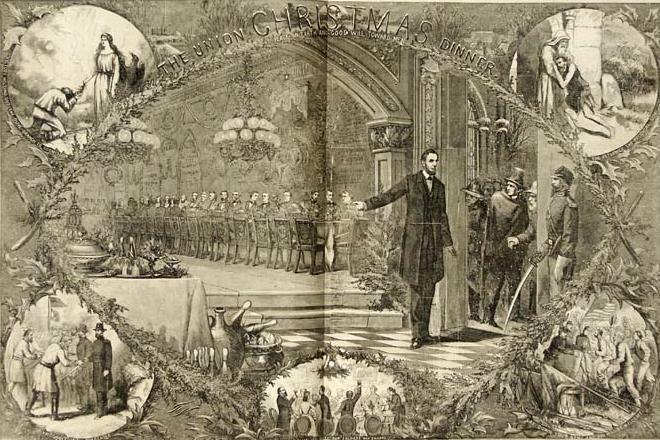 Lincoln welcoming defeated Confederates to the “Union Christmas Dinner.” Nast contrasts the wealth and plenty of the Union with the poverty and hunger of Rebellion. For the North, it would be a Christmas of anticipation and joy for many. For the South, it was a season of diminishing hope. The South had but its pride left to sustain it—the kind of pride that goeth before the fall. 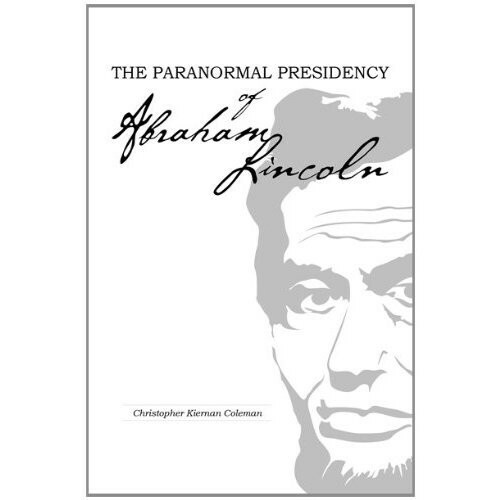 For more on Lincoln and the Civil War, read The Paranormal Presidency of Abraham Lincoln and Ghosts and Haunts of the Civil War. Now out is Ambrose Bierce and the Period of Honorable Strife, published by the University of Tennessee Press.